Flat Pad Air Bearings | PI Nelson Air Corp. In addition to round flat pad air bearings, PI Nelson Air has supplied a number of rectangular flat pad air bearings. These bearings are useful when the envelope of the system requires constraining the size of the air bearing in one direction but the load is larger than a round pad will support. In addition, long rectangular flat pad air bearings can resist moments and take the place of two round flat pads. To learn more about rectangular flat pad air bearings and how they can fit into your application, please contact us. 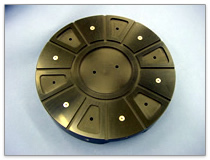 When flat pad air bearings are used in lightly loaded applications, it is common to use a vacuum preload. A vacuum preload allows the bearing to operate closer to its design loading and therefore optimal stiffness is obtained. Vacuum preload also allows the bearing to resist light pull forces. Any flat pad air bearing can be modified for vacuum preloading and tailored to your exact application. Although our standard flat pad air bearings can be used in a variety of applications, it is often beneficial to modify their design for specific applications. 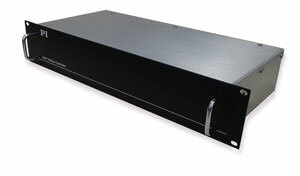 Working from our extensive catalog of designs, custom shapes, sizes, load capacities, and mounting options can be created quickly and at very little additional expense from the standard models. We will gladly help you design your configuration and mounting scheme to optimize bearing and overall system performance. Rectangular air bearing pads are available as well. 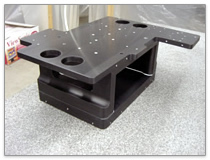 Large custom flat pads have been used for automotive suspension testing and setup.